The Gradebook Builder is a tool that assists you in creating a basic gradebook structure with categories and items quickly and easily. 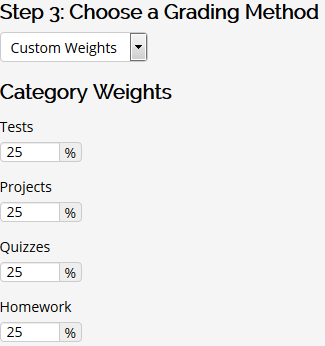 It allows you to set weights for the categories to account for determined percents of the final grade. Advanced options such as dropping a low grade and including extra credit items can be updated afterwards in the gradebook setup. Note: To use the Gradebook Builder, your Gradebook MUST BE EMPTY - The Gradebook Builder will not work unless it is completely EMPTY. If you have already created categories or items, you can delete them and use this tool instead. 1. Click on the Grades link in the Administration Block on your course front page. 2. Select Gradebook Builder from the dropdown menu in the center of the Gradebook. 1. Click within the Category Name text field and enter a name for the first category in your gradebook. Click the Add button to create the category. Repeat this step for each category you want to add. 2. You must add at least one graded item into each category. Click within the text field for the number of graded items and enter a value. Select the destination category from the dropdown menu and click the Add button at the right. 3. The default Maximum grade value for each item is 100 points. You can change this value updating the value in the number field. You can delete unwanted items by clicking the red X icon. 4. The default aggregation method Custom Weights allows for percentages to be set for each category in calculating the course total. Enter the percentage values in the text fields for each category. All of the percentages must add up to 100 before the gradebook can be saved. 5. Click the Save to Gradebook button to save your gradebook template. This will also save the gradebook structure as a template available for future use. 6. The resulting gradebook will open in the Gradebook Setup, which is an outline view of your gradebook. If you want to edit the item names, you can click on the Edit icon at the right of an individual item. Select Edit Settings. 1. Click the Choose dropdown menu. 3. Click the Save to Gradebook button to save your gradebook template. Note: If you want to save a new version of a gradebook template, click on the name text box and type a new name. When you save the gradebook setup, it will be saved as a new template that will be available to you in your other courses.